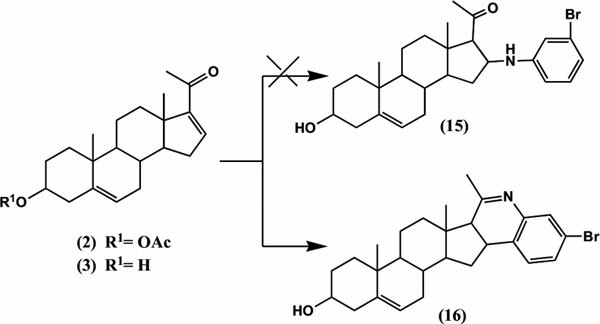 In the present paper, synthesis of few novel pregnane derivatives and their evaluation as potential anti-hyperlipidemic and anti-oxidant agents has been reported. The synthesis of 3β-hydroxy- 16α-methoxy pregn-5-en-20-one (4) was achieved by reaction of 3β-hydroxy-5,16-pregnadiene-20-one (3) with KOH/MeOH under reflux. Compound 4 on treatment with succinic and phthalic anhydride afforded compound 6 and 7, respectively. The reaction of the C-20-oxime-pregnadiene (8) with 1,5- dibromohexane yielded 20-(O-6-bromo hexyl)-oximino-3β-hydroxy-pregn-5, 16-diene (9). A novel heterocyclic derivative 3β-hydroxy-androst-5-en [17,16-c]-2′-methyl-7′ bromo-3′,4′-dihydro quinoline (16) was synthesized by reaction of 3 with 3-bromoaniline. However, attempted synthesis of other heterocyclic derivatives by reaction of (3) with other halogenated amine led to Aza-Michael addition products (10-14). The synthesized compounds were also evaluated for their anti-hyperlipidemic and anti-oxidant activities. Compounds 6 and 14 were found to exhibit more lipid lowering and antioxidant activities in comparison to other compounds. Pregnane, Aza-Michael addition, intramolecular condensation, anti-hyperlipidemic, anti-oxidant, steroid.